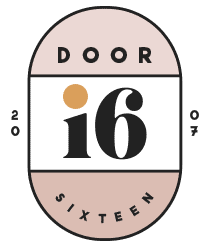 Door Sixteen is currently using a modified version of the Florence theme from Solo Pine, and is running on the WordPress.org publishing platform. I use a paintbrush, ink, paper, scanner, Photoshop & Illustrator for image editing and graphics creation, and I do all of my coding with Coda. I’ve been a loyal Dreamhost customer since 1998. If you need a hosting company, you can get 20% off at Dreamhost with the code DOORSIXTEEN.